Happy Friday! 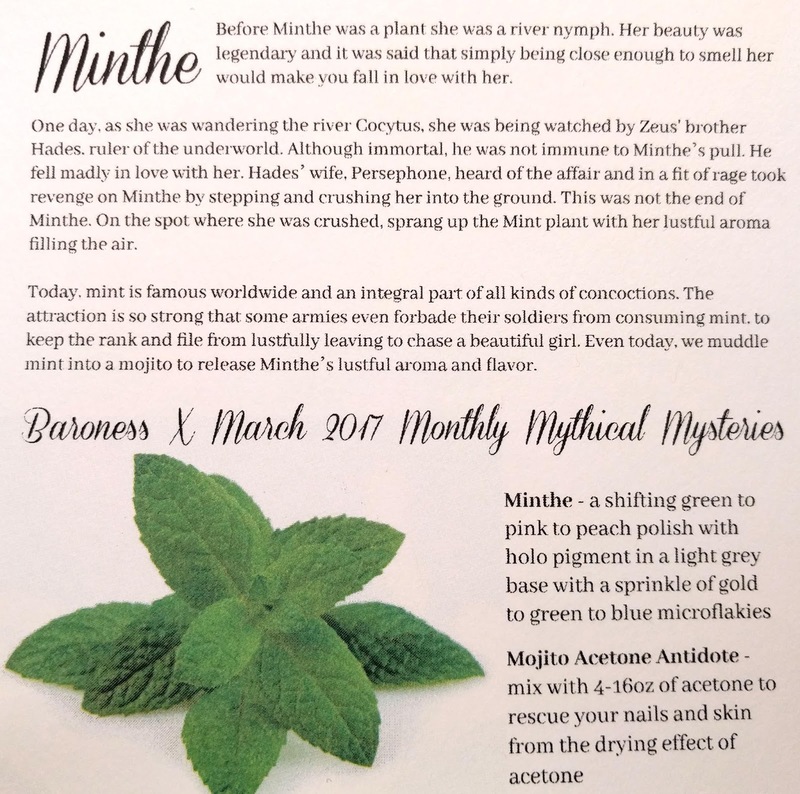 Today's post features the Baroness X March 2017 Monthly Mythical Mysteries box. March's box contained one polish and one Acetone Antidote. I'm going to focus on Minthe today since I have not yet had the need to mix up a new Acetone Antidote. I will say that Mojito smells amazing and that I can't wait to use it. I love getting the backstories behind each product, and find this to be a really nice touch. Oh hello shift! 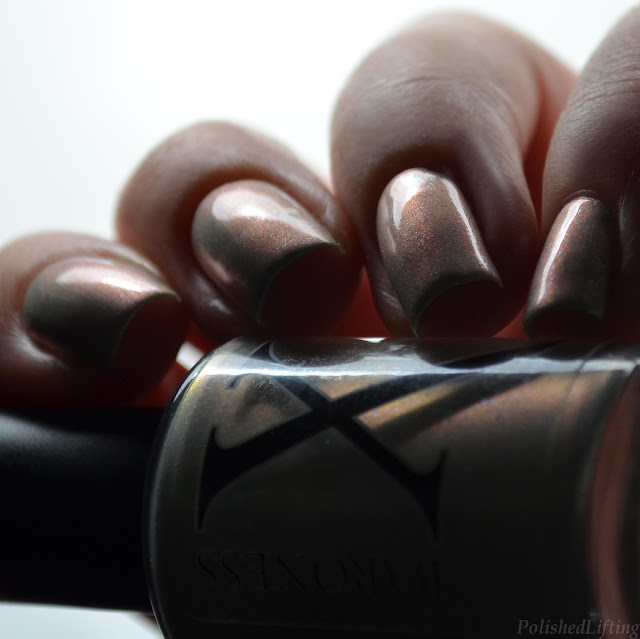 The cab topper and polish description inspired me to tease out the most dramatic shift possible. 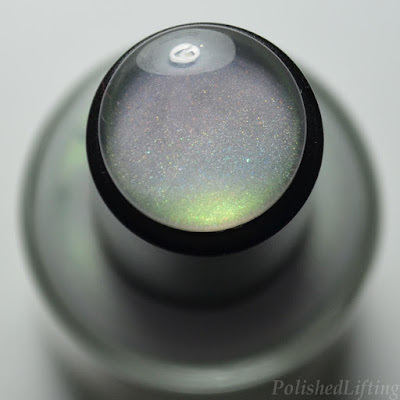 Finish: A shifting green to pink to peach polish with holo pigment in a light gray base with a sprinkle of gold to green to blue micro flakies. Notes: My swatches show three coats with the final coat sponged on to entirely eliminate brushstrokes. Brush strokes tend to happen with pearly finishes like this one, but I didn't find them to be particularly bothersome with Minthe. I sponged on the final coat just to show that you can completely eliminate them if you wish to do so. Here's the most dramatic shift I could capture with Minthe. Isn't it neat? I think it really shows off the blue flakies too! The Baroness X March 2017 Monthly Mythical Mystery is no longer available, but you can purchase future months by visiting the shop linked below. If you enjoyed this post you might like Baroness X Unicorn Box and Baroness X Ecto Set.